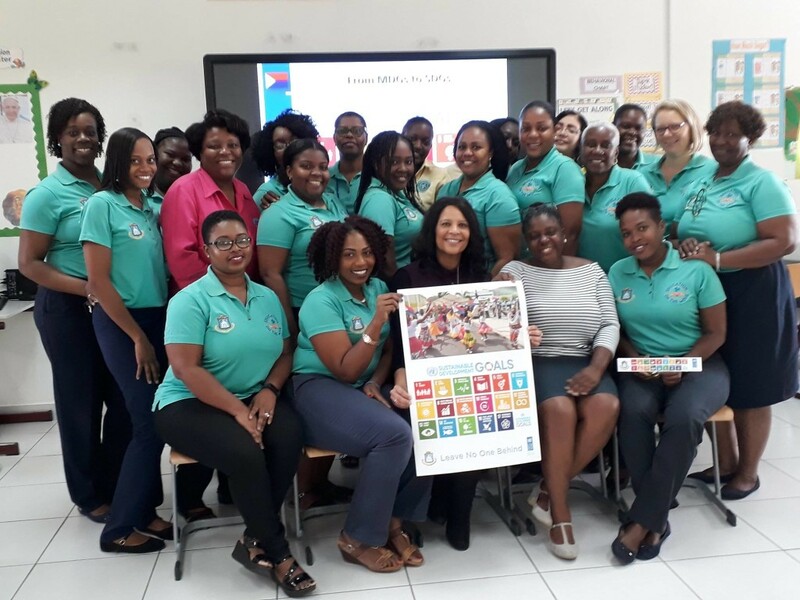 Sint Maarten National Commission for UNESCO and the Department of Interior and Kingdom Relations joined forces to kick off their series of presentations on the 2030 Agenda for Sustainable Development Goals (SDGs). All primary and high schools will be getting an explanation of the 17 Global Goals, which Sint Maarten has adopted, to develop the country. The St. Dominic and Sister Marie Laurence Primary Schools were the first schools to receive the presentation. Marcellia Henry, Secretary General of UNESCO and drs. Loekie Morales, program manager at the Department of the Interior and Kingdom Relations (BAK), visited the schools last Wednesday. Prime Minister, the Honourable Leona Marlin Romeo, and Minister of Education, Culture, Youth and Sport, Honourable Wycliffe Smith, are working together to build awareness and educate the community about the Global Goals Agenda, in particular the Sustainable Development Goals (SDGs), and in this occasion, the Educational sector. In the latter part of 2018, the school boards were given presentations on the SDGs, as part of the SDGs communication strategy. In 2019, the school management and teachers will receive information and instructional materials they need about the Sustainable Development Goals and the 2030 Agenda to pass on to their students in a practical way. At the kick off session at the St. Dominic School, Morales and Henry explained that the goal of their mission is to ensure that the Educational sector become knowledgeable of the SDGs and embrace the Global goals. According to the duo, it is imperative that schools receive the necessary information and materials needed for them to incorporate these topics into their existing curricula. The presentation included a short UN documentary on the history of the 2030 Agenda of the UN, from the Millennium Development Goals (MDGs) to entering the SDGs era in 2016. The concept of the 2030 Agenda, the core SDG relevant to the Education sector, which is, SDG # 4 (Quality Education), and other related SDGs were also highlighted. During the presentation, the teachers got the opportunity to review several websites from UNESCO, UNICEF and the UN, which contained a number of available educational materials (lesson plans, projects, games, comics, videos, stories) on the SDGs, which can easily be incorporated into the school’s Science, Social Studies & Technology, Language and Communication, Philosophy of Life, Social Emotional Development, and Cultural and Artistic Formation curricula. Morales and Henry also gave recommendations on how to go about incorporating the SDGS in lessons using stories, comics, videos, and projects. The teachers and school managers had positive feedback concerning the SDGs and the 2030 Agenda. They were actively involved in the session, which closed with Questions & Answers on the Global Goals topics, and the handing over of a USB stick with all the SDGs material and the school’s relevant curriculum on it. The Sint Maarten SDGs Poster & SDGs book markers were also handed over. The Government of Sint Maarten, mainly the Ministry of General Affairs (the Department of BAK) in collaboration with the Ministry of Education, Culture, Youth and Sport supported by the UNESCO Office and the SDG Think & Do Tank will facilitate the coordination of these school visits in the first quarter of this year. 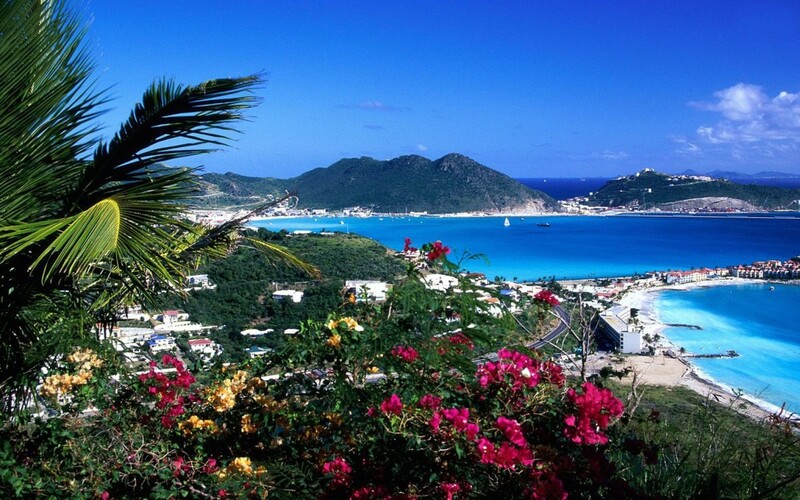 The Ministry of General Affairs is responsible for the Sustainable Development Goals for Sint Maarten on a whole, with the Department of BAK being responsible for spearheading the 2030 Agenda, in collaboration with all relevant ministries. To reach sustainable development, a collaborative effort of all sectors in our community, and partnerships with NGO’s, civil society, the private sector and other countries is needed. Anyone interested in participating in the 2030 Agenda for Sustainable Development can contact program manager Ms. Loekie Morales at 527-1223, or visit the Department of The Interior and Kingdom Relations (BAK) at the Government Building on Pond Island.